I knew that I wanted to bear witness to this landscape, but where to start? At the urging of landscape architect friends, I emailed Lee Frelich, Researcher and Director of the University of Minnesota's Center for Forest Ecology for advice. Two days after this cold-call email, I was sitting in Frelich's office and he was telling me about upcoming research work planned for the severely burned area around Isabella Lake and Island River. He suggested that I be in touch with Lawson and Lynden Gerdes, ecologists with the Department of Natural Resource's Minnesota Biological Survey Unit who research plant communities in the BWCAW. I followed up on Frelich's recommendation and several months later, accompanied Lawson, bouncing along in a DNR pickup down Forest Road 377 (Tomahawk Road) to work as a volunteer on a plant survey in the burn area around Island River. My role was to produce photographs. Lee Frelich and Lawson and Lynden Gerdes (who have become close friends) have been supportive of my investigations and generous with their time and advice. I owe them my gratitude. Their scientific insights about the subjects in my photographs has helped my understanding to grow, improved my photographs, and will enrich this blog. It was difficult to get my bearings during the first visit to the burn area. 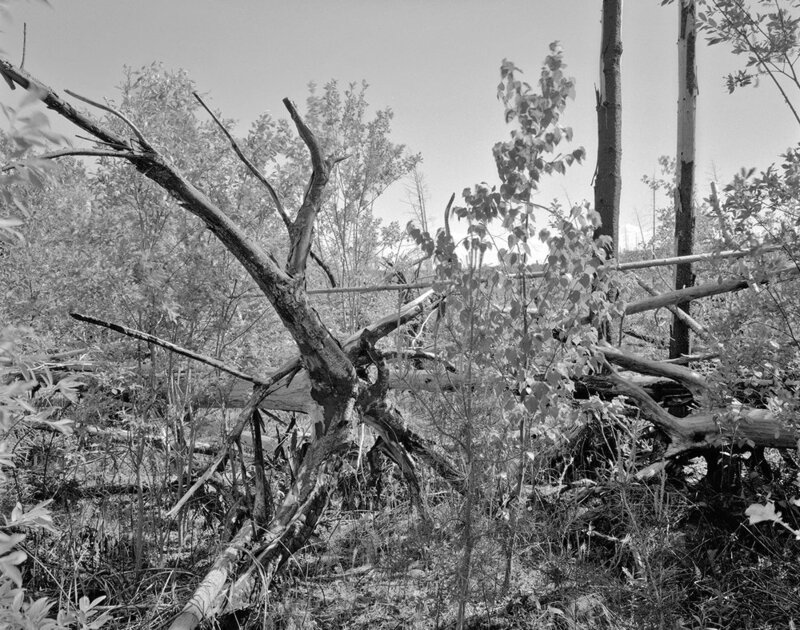 I had photographed native landscapes in the Midwest for over twenty-five years. Mostly forested lands, some waterways, and many with unique geological features and plants. But what do you photograph when all has been erased by a fire? This was not only an aesthetic problem, but an ethical one - employing traditional compositional approaches and theories of beauty did not seem adequate. What do we really see when we perceive beauty in a landscape? 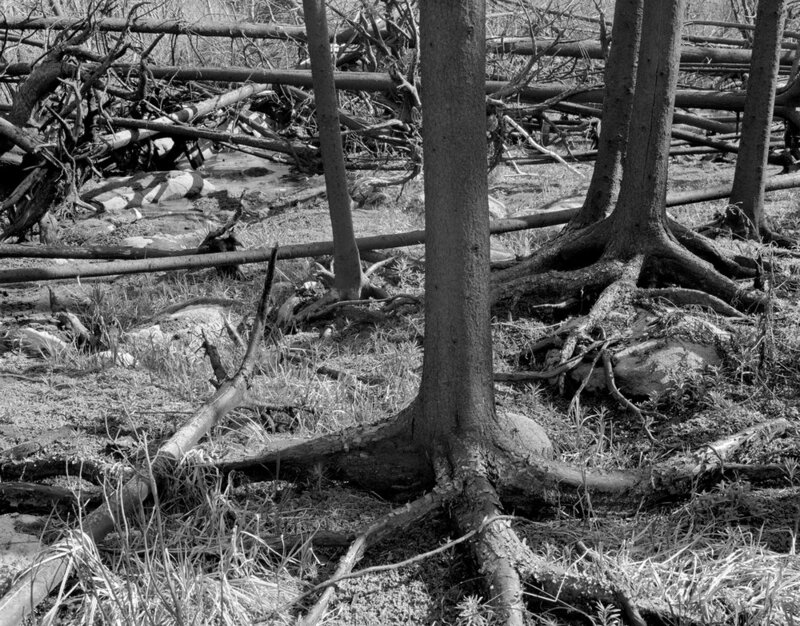 Trance-like, I stumbled through the landscape, photographing a curvaceous tree root clinging to a boulder at what became Site #2 ; a ravine with scorched trees with tentacle-like roots grasping the burnt soil (Site #1, see photo series below); and bluff-top views to a waste-land of incinerated trees (at Sites #3 ,#4 and #5). At the end of a long day, I was filthy and exhausted and didn't know whether I had made any photographs of consequence. Later, when I processed the film and studied my contact sheets, I realized that, remarkably, all of my photographs, all of the compositions, featured a prominent boulder or rock outcrop; an element that likely would remain constant within a changing environment. On subsequent visits, as the vegetation slowly recovered and later became profuse, geological forms became the thread to connect these landscape views across time. First visit to photograph the fire area in May 2012 accompanying Lawson Gerdes, ecologist with the Minnesota Department of Natural Resources Biological Survey (who took these photos of me). On my second trip to photograph the fire area four months later in September 2012, at the end of the first growing season post-fire, I returned to the locations visited on the first trip. I began a series that continues to this day; ultimately comprising six locations. 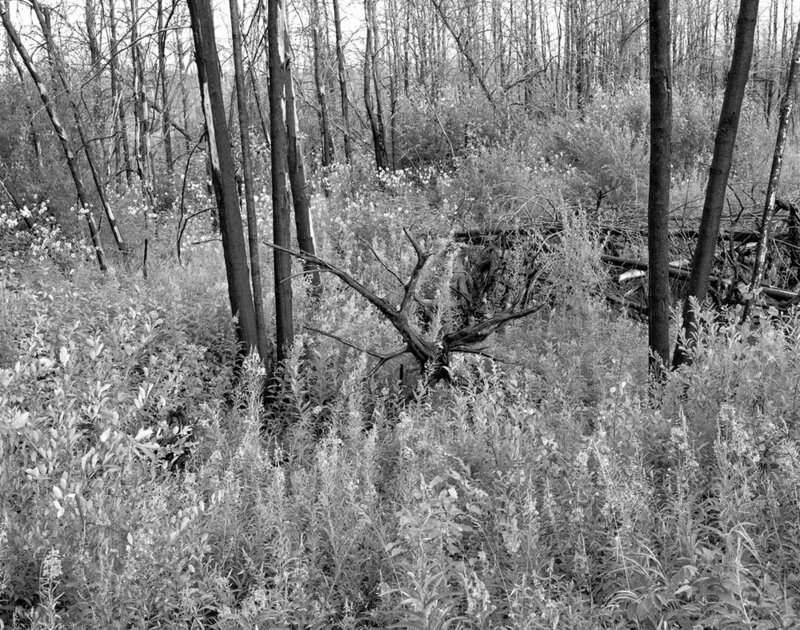 I park at the bridge at the entry point, walk northeast on Forest Road 377, and enter the landscape via an overgrown abandoned railroad grade. (A remnant of the town of Forest Center with a population of around 250 from 1949-1964 who worked for the Tomahawk Timber Company.) Then I proceed overland, threading my way through downed trees, for about a half mile to a high point above the river. #1 Ravine between a rocky outcrop and the abandoned railroad grade; photographs made facing south. #2 Slightly down-slope on a rocky outcrop, photographs made facing north. #3 View down-slope south to Island River. #4 High point on rocky promontory, facing north and east . #5 High point facing north (only one image from this location; I couldn't find my way back to it). To be able to return to my locations, I noted the GPS coordinates on my iPhone (pretty good reception because of the lack of tree cover) and banded some standing trees with bright pink tapes. Later, I recognized boulders as landmarks. Now, I know the area well. I usually arrive around 10 am (it takes about an hour to get to Entry Point 34, traveling 20 miles an hour on the rutted Forest Road, occasionally stopping to remove downed trees). I tramp overland to begin at Site #2, then break for lunch at noonday, sitting on a large flat boulder. Moving on to Site #3 across a wet meadow and up a steep rock outcrop to the high point, I arrive about 1:30 pm. By the time I set up my field camera, the light has moderated from its harsh noonday intensity. (Remember, there's no tree cover here at all). I photograph Sites #3 and #4 in succession; one faces southwest and the other, north. Then I spend the middle of the afternoon down at the river's edge at Site #6. Around 4:30 pm, I head back uphill and over a rock outcrop into the ravine, Site #1 (shown below). I photograph facing south with the light just coming over the outcrop from the west; the ravine is in partial shadow. First visit to the fire area. Spring of year-one post fire. Fall of year-one post fire. Fireweed blooms profusely on the incinerated, high-nitrogen soil. Early spring of year-two post fire. Last year’s die-back is visible; but too early for plants. 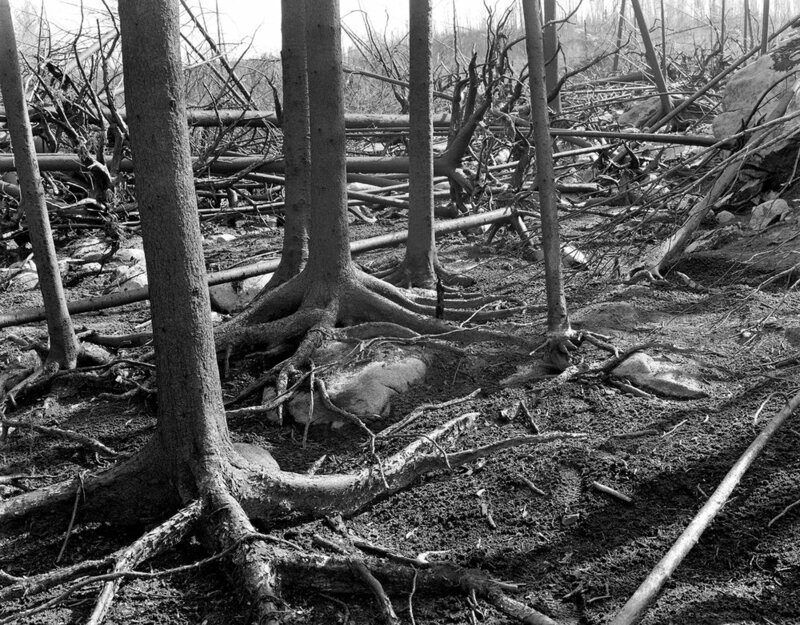 Fall of year-two post fire. Big changes. Trees have begun to topple. Grasses and sedges and some shrubs join fireweed. Late spring year-three post fire. More trees toppling and increased vegetation. Summer year-four post fire. Profusion of vegetation, especially Compositae (sunflowers). Summer year-five post fire. 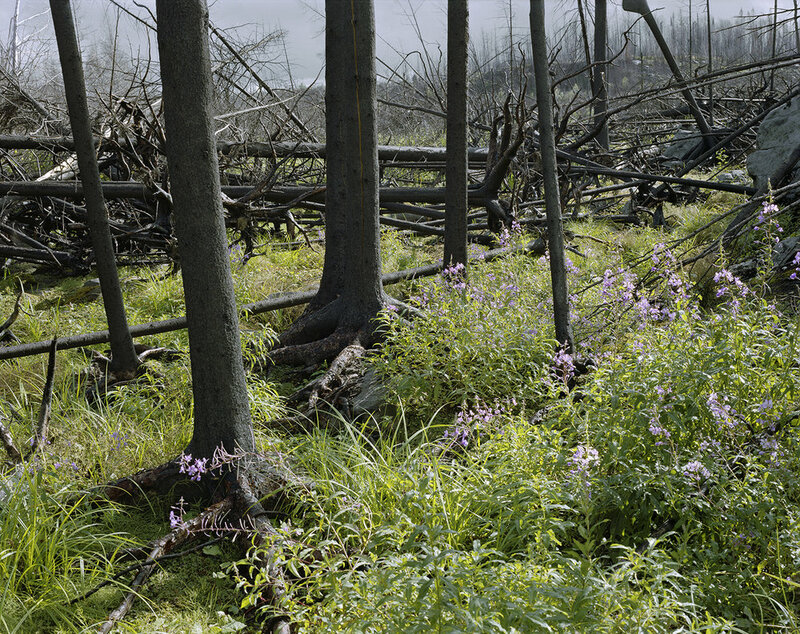 Vegetation overtakes decaying burned trees. Fall year-six post fire. More than a year since the last visit finds shrubs 4-6 feet in height. Spring year-seven post fire. Ravine almost impassable because of lush shrub growth. Trees significantly decomposing. Island River Site #5, May 2012. The only location that I was not able to find on subsequent visits.